This post is from my colleague Barbara Finamore (Director of our China Program). It is a set of important first steps that China and the US could undertake to help reduce global warming pollution. Moving these two countries together will be critical to securing a strong global commitment in Copenhagen. And there have been some important signs from China that they might be poised for a serious step to address global warming (as I discussed here). The recent high-profile visits to China by leading members of Congress and the Obama administration have made it clear that China and the U.S. are taking climate change seriously and recognize the importance of working closely together to find ways to reduce global warming pollution. Although China and the U.S. are the largest greenhouse gas-emitting countries in the world, they also have the potential to be the most important contributors to solving climate change if they work together to combine their resources and experiences to promote widespread deployment of low-carbon technologies. Based on NRDC’s experience working in China on energy and energy efficiency, we have put together a set of three concrete proposals – summarized below – that we believe will benefit both countries and offer valuable opportunities for sharing technical and policy expertise and experience. In addition, we offer here a fourth proposal – sharing best practices on collecting and reporting emissions and energy data – that can help both countries to improve their emissions and energy data and strengthen mutual understanding of and trust in each others’ energy and GHG emissions reporting. We believe these proposals are win-win opportunities and offer enormous potential for reducing greenhouse gas emissions. Although we have focused on projects that can take place in China, we believe that the US would learn and benefit a great deal from participating in these projects, since both countries share many of the same challenges to improving energy efficiency and reducing emissions. The first proposal, working to develop and implement building energy rating and labeling systems that measure the energy performance of buildings, addresses two key barriers to achieving greater building efficiency: (1) the lack of compliance with building energy codes and (2) the lack of information about a building’s energy performance. By providing an objective, transparent measure of a building’s energy performance, a properly designed building energy rating and labeling system would be a powerful tool for strengthening code compliance within China’s massive and rapidly growing building stock. In addition, if the system for rating building energy performance in China can be harmonized with those in the U.S., Europe, India and elsewhere, it will allow for more accurate comparisons of building efficiency among countries and provide the basis for mechanisms that could provide carbon market-based financing for building efficiency initiatives by developing countries. (Such mechanisms are being considered by the United Nations Environment Programme’s Sustainable Buildings and Climate Change Initiative). In China, we have been working with the the US-based Residential Energy Services Network (RESNET) (which developed the Home Energy Rating System index adopted by 16 US states, as well as by the EPA and IRS) and the Shanghai Real Estate Science Research Institute (SRESRI) (the building standards development agency for the Shanghai government) to develop a building energy performance rating and labeling system appropriate for China. Based on this cooperation, SRESRI published a voluntary building energy rating standard for high-rise buildings in Shanghai which the Shanghai government has approved. The central government’s Ministry of Housing and Urban-Rural Development has also developed similar building energy rating and labeling guidelines (Chinese only), which are mandatory for new government buildings and large public buildings. Joint development and harmonization of building energy rating and labeling systems, to allow inter-country comparisons of building efficiency and provide a basis for international financing of building efficiency initiatives. Development of customized building and energy rating software that can quickly and accurately rate buildings. Training private-sector building energy raters to enable widespread adoption of building rating systems and supplement government monitoring and enforcement of building energy codes. The second proposal focuses on how the U.S. and China can cooperate on CCS demonstration projects that take advantage of China’s existing industrial sources of pure CO2 from fertilizer, liquid fuel, chemical, and petroleum refinery plants in order to rapidly gain experience with sequestering hundreds of thousands and even multi-million tons of CO2 in suitable basins. Although there are already CCS cooperation efforts between China and the UK, EU and Australia, and the U.S. and China both have large-scale plans to include CCS on the FutureGen and GreenGen power plants, taking advantage of China’s existing sources of CO2 now would provide valuable practical experience and scientific knowledge by injecting large volumes of CO2 underground at reasonable cost and beginning to characterize key basins, and could set the stage for future larger-scale retrofits of existing power plants. 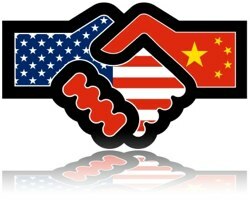 The US and China could cooperate to share capital costs and expertise in establishing five such projects in China, starting with a feasibility study, proceeding to a smaller injection on the order of hundreds of thousands of tons of CO2 and, if successful, ending with a multi-million ton injection program. All this could be completed within about five years, and this experience could then be used to establish two large-scale, power plant retrofit projects within China. US and Chinese efforts and exchange could be coordinated through a U.S.-China Carbon Sequestration Partnership, with an associated fund to conduct information exchange, compile technical best-practices expertise, and engage in outreach and education. The third proposal seeks to share US federal and state experience with energy efficiency resource standards (“EERS”) with China, in order to establish a sustainable mechanism for funding energy efficiency through China’s grid companies, which are responsible for procuring electricity supply. In the US, 19 states have adopted EERS that require their utility companies to offset a certain amount of their projected load growth through investments in energy efficiency. For example, Vermont adopted an EERS in 2000 which allowed it to meet over 7 percent of its electricity requirements through energy efficiency by 2007. The key goal of an EERS policy in China would be to set mandatory energy efficiency targets to be met by efficiency programs administered by China’s grid companies, and to allow the grid companies to recover the costs of their energy efficiency programs through an increase in the retail electricity prices they can charge. Such a policy would promote energy efficiency as a resource on par with new supply, help to reduce peak load and energy consumption growth, and serve to complement China’s existing energy intensity target. In addition to the three promising areas for cooperation above, a fourth area in which both the US and China could benefit greatly is in sharing best practices on collecting and reporting energy and emissions data. Discussion and exchanges between the main bodies responsible for collecting such data in each country – DOE, EPA, and the Department of Energy’s Energy Information Administration in the US and the National Development and Reform Commission and National Bureau of Statistics in China – to share how they collect and report energy and emissions data could help both countries to improve their data collection systems and gain confidence in each other’s energy data reporting. Because energy consumption from fossil fuels – coal, petroleum and natural gas – constitutes the majority of GHG emissions in both countries, exchanges on best practices for energy data collection would lay a solid foundation for building confidence in each country’s GHG measuring, reporting and verification (MRV) systems. Possible areas for discussion include: how data from the facility and local levels is reported up to the national level and methods for ensuring accuracy; how emissions data can be improved through better data on fossil fuel consumption and fuel-specific emissions factors; how continuous emissions monitoring systems on power plants and industrial facilities can provide improved, real-time energy and emissions data; and the use of common, sector-specific methodologies for reporting the energy performance of buildings, power plants and energy-intensive industries, in order to facilitate sector-by-sector comparisons and sector-specific financing for energy efficiency and emissions reduction projects. Both China and the US are continuing to improve their systems for collecting and reporting energy and GHG data: the China Electricity Council has recently begun reporting national electricity usage on a monthly basis, for example, while the US EPA has prepared a draft rule to require reporting of GHG emissions from large sources starting in January 2010. These efforts should be communicated and regularly discussed (for example, as part of the Climate Change Policy Dialogue both countries recently agreed to), to allow each country to learn from the other’s experiences in improving the accuracy and reliability of their energy and emissions data.